The all-American hamburger gets the CD international treatment with infusion of flavors that span the northern and eastern Mediterranean. An oh so easy classic you might just turn into a weeknight menu staple! America has a love affair with the poorly named hamburger. Though the name refers to its attributed origin – immigrants to the US cooking steak in the style of Hamburg, Germany, it always threw me off as a child, thinking it was made from ham. And clearly, the rest of the world has embraced the burger concept as a signature American export – one that has moved well beyond fast food, judging by the explosion of gourmet burger joints throughout the Americas. I’ve seen fancy pants burger houses in places as far flung as Peru, Oman, Austria, Lithuania, and Hong Kong. The meat patty (or non-meat) on a bun concept resonates with an audience receptive to culinary globalization. Ok, enough waxing philosophical. Let’s get down to business. You just want to know about THIS burger, right?? Ok, ok you all know I like to get a little too much into the “diplomat” before delving into the culinary. So I recently joined an old friend’s seven day clean eating challenge, complete with set meal plan. When she mentioned that she was looking to me to put my own spin on the recipes, I tried to step up to the challenge. When it came time for the turkey burger, I wasn’t the most confident. 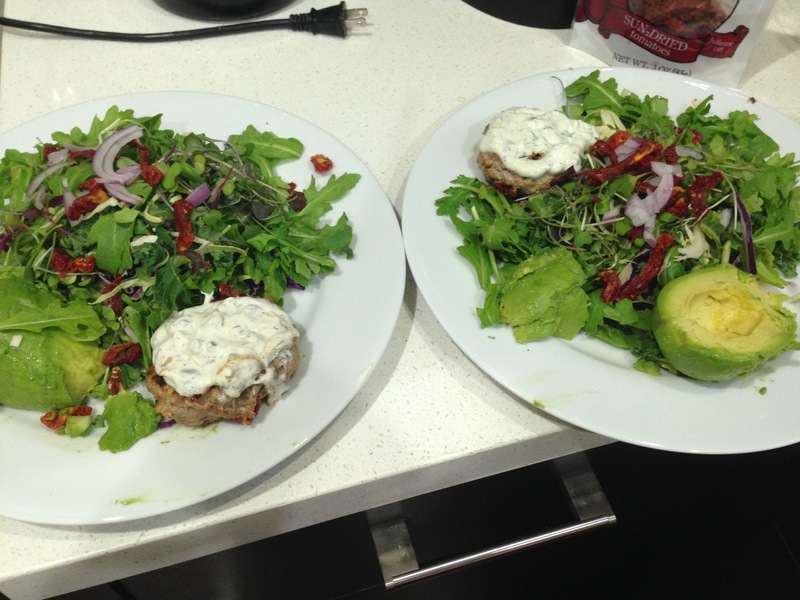 Homemade burgers have never interested me, as I’d prefer even a pseudo-beef cheeseburger from McDonalds over DIY. 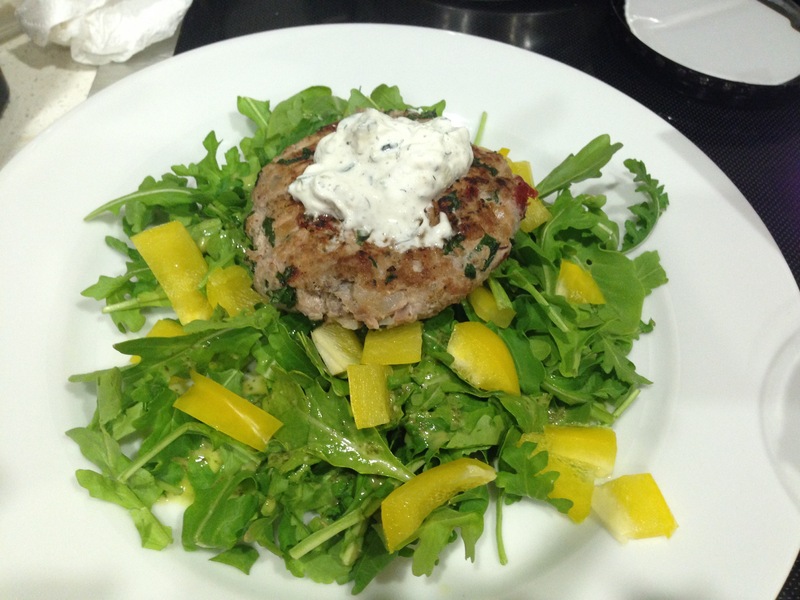 But I decided to incorporate a few of my go-to healthy ingredients to spruce up an otherwise bland patty. A few key points to ensure your burger is a success. 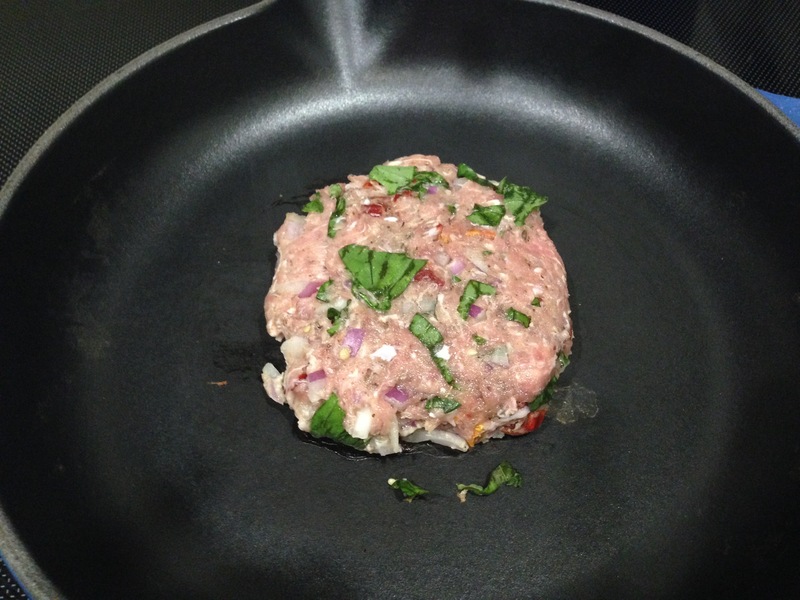 First, do NOT use the leanest ground turkey; a bit of fat is necessary to ensure a moist, juicy burger. You can substitute ground beef, bison, chicken, or lamb if you prefer. I serve it directly over salad, but it’s perfection with a multigrain bun. Finally, this recipe uses portions for a single serving; simply multiply to make as many as you need. Definitely make and eat them as soon as cooked. They are so easy to make, minimal prep is needed! In a small bowl, massage the spice blend, salt and pepper blend throughout the meat. Next, add in the fresh vegetables and basil and massage to incorporate all evenly. Roll the mixture into a ball; press onto a firm surface (cutting board or wax paper atop counter) with hand to flatten to about 1/2 inch thick patties. Grill or pan fry (with a slight amount of olive oil or cooking spray in a nonstick pan, or, preferably a cast iron skillet) for 3-4 minutes on each side, or until slightly brown and cooked through (poultry should have lost all pink color; beef/bison or lamb may be cooked for less time on higher heat to produce a pink center). Serve over salad, lettuce wrap, or bun, topped with 1-2 Tbsp. tzatziki sauce.